The ninth edition of “Young Wine Festival” starts on November 24th. There will be 36 cellars that will feature over 250 species of elixir. More than 10 tons will be consumed according the organizers for the whole fest. According to an old tradition, the event will begin with a parade on the Main Street, and then guests will be able to visit 15 wine houses in the Old Town, said President of the Tourism Council, Mr. Lubozar Fratev. The tastings will last 3 days. The warming for the new wine festival begins on Monday with concerts and friendly meetings. The commission of tasters is already ready, which will have the heavy word on the quality of individual beverages. Experts will emit the best young white, red and rosé wines. The winners in each category will receive gold, silver, bronze and platinum Dionysus respectively. The awards will be given during the “Wine Crafts Evening” next Saturday. The competitive nature of the event stimulates not only cellars but also customers who want to buy from the winning wines. Organizers expect more than 18,000 visitors to taste the different varieties and specially prepared appetizers suitable for their respective drinks. The parade will be opened at 1 pm on November 24 (Friday) when the Dionysius procession begins. 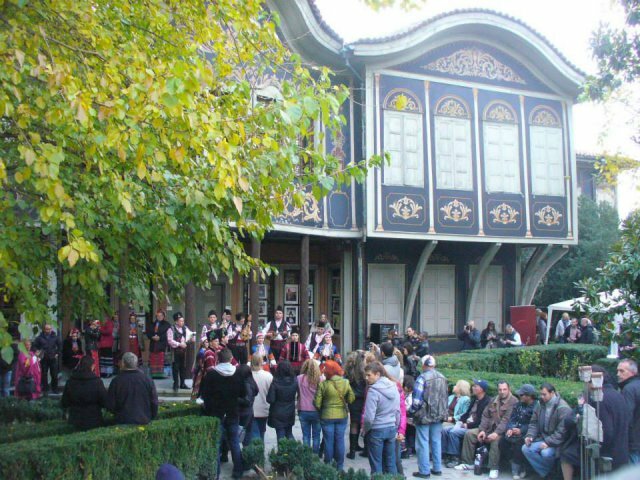 It will start from the square in front of the Municipality and will head towards the Old Town, accompanied by the Trakia folk ensemble. The official launch of the tasting of the young wine will begin with the “The Barrel of the Young Wine” awarded by the last year’s winner of the award. The symbolic ritual of opening the barrel will be carried out by the chairman of the budget committee in parliament Menda Stoyanova. For the first time the cultural program will be opened with a Karaoke and Wine party and presents for all participants. The program’s innovations continue on Wednesday, when a special film, which represents the reconstruction of an ancient Thracian ritual, will be broadcast. “The Tourism Council is proud of the event and wants to develop it more and more,” said Lubozar Fratev. The main organizers of “Young Wine Festival” are the Council of Tourism, Plovdiv Municipality, University of Food Technologies – Plovdiv, with the support of a number of companies and organizations. Students from the Philosophical-Historical Faculty of “Paisii Hilendarski” University will look for the benefits of Plovdiv from the traditional “Young Wine Festival” event, the organizers announced. Together with his lecturer Prof. Krassimira Krastanova, they will visit every house in the old town gorge. Their survey will show the benefits to tourism and business in the city under the hills that bring the initiative – influx of tourists, jump in restaurateurs and hoteliers business. 31, Pr. Mariya Luiza blv.